Today, I'm joining up with Amanda & Stacia from Collaboration Cuties to discuss a must read Social Studies mentor text for Veterans Day. At our school we do a 5th grade celebration for Veterans Day. Students are invited to bring in photographs for a Wall of Fame/Timeline of their friends and family that have served our country plus veterans are invited in for a special breakfast and presentation. Students honor Veterans by reading some special poems and presenting them with a powerful "Just Three Words" video that showcases the meaning of Veterans Day in literally "just three words" by each student. However, before we can start celebrating on November 11th - we need to prepare by reading some amazing mentor texts. Many of our students have some background about Veterans Day but we do read a short nonfiction piece about how Armistice Day became Veterans Day first. 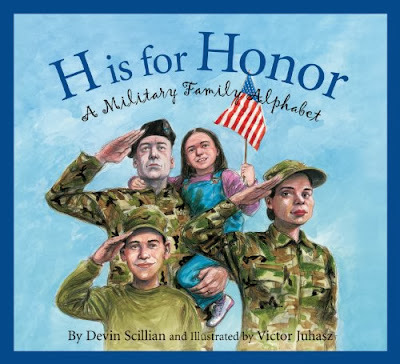 Then students begin their collecting of additional "knowledge" about veterans through the reading of the book, H is for Honor by Devin Scillian. We then continue our study and independent reading with some other great books about Veterans Day. Here are a few of my other favorites that relate to this amazing holiday! Both America's White Table by Margot Theis Raven and Granddad Bud: A Veterans Day Story can be found on Amazon! We use America's White Table to introduce our students to a Remembrance Table which we set up during our celebration for those who are unable to be with us. Granddad Bud's story is great because it's perfect story to introduce students to Veterans Day celebrations and the meaning of Veterans Day because the students in the book have also invited veterans into the classroom. How do you celebrate Veterans Day in your classroom or at your school? But what happens after students "finish" a book club study? That's where the 30 Book Challenge comes into play! I was inspired by a Pin I saw on a Pinterest from Runde's Room's Teachers Pay Teachers store. I thought, This looks like something my fifth graders would LOVE... so, why not give it a try! My fifth graders love a good competition, only (shhhh!) this competition is with themselves. I found this great recording sheet online Google Docs. Click the image to get you copy! This challenge really seems to motivate many students to keep reading even when they have "finished" our in class reading work. It also gets my "fiction junkies" into some nonfiction information texts and biographies. Plus, there are still 8 free choice squares... Who doesn't want some choice? Our school also has a huge annual fundraising and reading competition each year. It's kick off is a video of principals, teachers, and other students reading and getting excited ABOUT reading! This year even author Cynthia Lord even joined our video! We just wrapped up this year's Recording Breaking Reading Challenge. Our goal as a school was to read 1,000,000 minutes! Students could use any books finished during our school wide campaign for my 30 Book Challenge! The week end in a victory cheer as we exceeded our goal of hitting 1,000,000 minutes! That means teachers and principals will be racing in front of students next Friday for the ultimate bragging rights! The best part, most of the work is hands off from my end - students only need to record evidence they read by stopping and jotting about the books on their weekly reading log and recording the books in the "Books I Read in 5th Grade Chart" in the data sections of their binders for books to count. You can grab my In School and Out of School Reading Log for free by clicking the image below. How to do you keep reading motivation alive? Reading Workshop: Tricks & Treats! 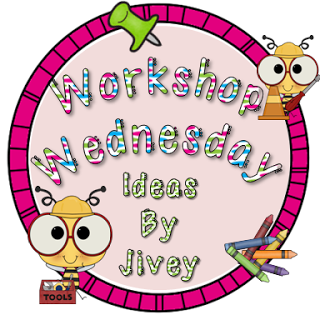 I'm linking up with Jivey from Ideas by Jivey for her Tricks & Treats for Reading Workshop! I feel like my reading workshop is running great this year and I haven't had to do a lot of "Just Right" book "tricking" so far. We're actually just finishing up our first unit on character and getting ready to start nonfiction very soon! As we wrap up our unit, here are a few of my tricks and treats for Reading Workshop! Trick #1: Make a "scavenger hunt" for reading activities. Students love competition and thinking things are a game when really they are investigating a new topic. I have an investigative scavenger hunt to help students learn the purpose of text features during our nonfiction unit - they love going around my room and looking at all my posters trying to figure out the feature plus how it can help us as readers. Trick #2: Give students different materials to write with and on! This year I found some neon notebook paper at Kroger and we've used it for a reading response letters and some grammar work. The students go crazy when I get it out. They also love writing on "fun" post-its. I found discounted "Q's" for when we add quotes to our pieces to show evidence and support from a text. I also have some great creepy fingers from the SLANT exchange that I'm trying to incorporate during October. Plus, my fifth graders love just plain colored post-its! Rock what you have! Trick #3: Get excited about reading! I start each unit off with a "virtual" book pass where we all watch You Tube previews or videos for the featured book club novels. The kids love watching all the "previews" and getting excited about books. I also swoon over authors like movie stars and show-off my photo with Roland Smith in my library! Trick #4: Play the CD! So many books have a fantastic audiobook. I was a little offended the first time my students asked for the "Lady on the CD" to read to them but I soon gave in because they wanted to read! They do love listening to me read - but it's also nice to hear a different voice or accent to help bring certain characters to life! Listening to fluent and expressive readers during read aloud is fantastic. I also encourage audiobooks and reading along to all my struggling readers. Two of my favorites on CD are The Tale of Desperaux and Love that Dog/Hate that Cat. Treat: A not so scary list of reading response ideas for those "Stop and Jot" moments during your Reader's Workshop. Click the image to download your own copy! This week I'm working on motivating my students to learn more about the regions of the United States! So, of course, I had to link up with Joanne from Head Over for Heels for Teaching for her Spark Student Motivation Saturdays and with Diane from Fifth in the Middle with some of my team's motivating geography techniques. 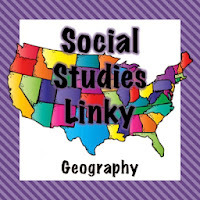 This week in Social Studies, I launched our next big study on the Regions of the United States. Our first stop is a train tour of the Northeast. This aligns with our text, Social Studies Alive! But we are not using the text's notes but instead are creating our own "interactive" suitcases for this unit. Students will be filling their suitcase with notes, maps, Kodak moments, and more as we travel throughout the Northeast. *The handouts are courtesy of Erin at I'm Lovin' Lit's editable pages in her Interactive Reading Literature Notebooks. I just modified them to work with our Social Studies text! I do realize the Muse song title is wrong. It has since been corrected. The theme song for our Boston trip is Muse "Uprising." Then, to get our students even more excited about our cross country trip, we also introduced our Great State Race Project this week. Each homeroom is asked to collect postcards from each of the 50 states. The first homeroom to collect a postcard from each state wins a special victory celebration! The students really get into competitive mode here and love seeking out the postcards. This project allows all students to get involved on some level and provides leadership opportunities to students who really want to track down those "remaining" postcards. We hang a big USA map in the hallway and connect the postcards to the states. It's a BIG deal. Plus, they can also track each homerooms progress. Here's the letter I send home with my students. Click the image to download it from Dropbox. Don't forget to check out all the great Student Motivation ideas on Head Over Heels for Teaching plus all the other Geography ideas at Fifth in the Middle! Five for Friday: 30th birthday, Cynthia Lord, and much more! 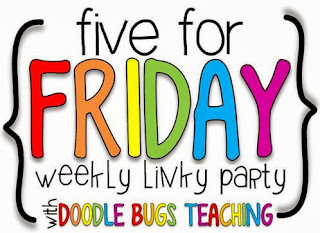 I had to link up with Five for Friday this week because it's been a very busy week around here! We've had a lot going on...hence the delay in blogging this week. So here's a quick recap of my eventful week of festivities! This week I celebrated my 30th birthday! It was a big birthday and it happened to fall on Columbus Day. I was happy to have the day off work. I spent the day with my mom at the zoo. I also got to celebrate at the Melting Pot (Yum) and then have some chocolate cake! Cynthia Lord came to our school again this year! I think I was just as excited as the students! She does such a great job with the kids. The students love interacting with her! We learned that in Russian the title of Rules is "Keep Your Pants on in the Aquarium"... We also learned she'll have a new book coming out next year, Half a Chance. However, best part was that she Facebooked our team after the presentation and personally thanked two of our students for writing the introduction and conclusion to the presentation - what a wonderful person and author! It made our students' day! This week we studied theme.... Students used Rules as the mentor text and then found themes in their own book club novels. We learned from Rules that friends should like us for who we are and that sometimes it's okay to break the rules...especially if it's rules we create to keep others from getting to know us! We also started using Nicole Shelby's Reading Interactive Notebook for theme - two thumbs WAY UP! We launched our Northeast unit this week...or attempted too! We got our unit started but we didn't get very far on our train tour! Students did create words for our word wall - look at this cute picture for population density! I was able to get some new nonfiction resources to share between the language arts and social studies department at our school. Our curriculum leader just dropped these off - our district really is so amazing! Right now, we only have one set but hopefully maybe next year we can get a few more because these books from National Geographic are absolutely amazing. Can National Geographic do no wrong? I can't wait to use them and share them out! In 1492, Columbus sailed the ocean blue and now we get a holiday.... Usually, we're not off school but this year it happened to fall during our Fall Break. Therefore, in honor of the holiday and being off school for Fall Break I thought I'd share with you some journal entries I've had my students complete in the past during our explorer unit. Feel free to grab a complete copy from my Dropbox here. You can also use these questions as write arounds during explorer stations! They provide some great thinking and students generally have some great thoughts on each topic! 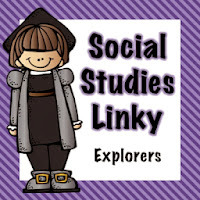 I'm linking this post up with Diane from Fifth in the Middle's Social Studies Explorer Linky. Don't forget to check it out for more great explorer lessons! I've always been frustrated by how to teach grammar! I tried the "DOL" type approach but I never it saw it transfer over into student writing. Then I tried short mini-lessons based on the type of writing we were doing in class. Those worked but students seemed to forget by the next piece some of the ideas of the lesson... then grammar seemed to fall by the wayside in my room for a while and I focused on ideas, craft, organization, and everything but mechanics. But that also drove me crazy! I wanted my students' writing to look intelligent! What's a teacher to do??? Then, I was introduced to Jeff Anderson's school of thought! Light-bulb moment! Have students take ownership and notice things about "good" writing. Stop showing them mistakes and bad grammar! Start showing students all the things great authors do well and have them intimate those "tricks" in their own writing. It's how we teach author's craft in workshop - why not grammar too! I owe a huge thank you to my colleague Amy who got me on the Jeff Anderson grammar bandwagon! After talking to her about her grammar units and discussing it with my teaching partner we decided to try out Ideas by Jivey's Mentor Sentence starter pack this year to ease our students into the process. My teaching partner and I are in love! We recently purchased the third set of sentences to continue the process! Here's my spark....Let students take ownership! Students do all the noticing. They are the experts. I fill in with some reminders or names of things like "Oh, great you noticed the adverbs" but otherwise... it's all on them to notice the great things author's do. Students name the grammar rule. We don't use the "fancy names." What fifth grader remembers that anyway. We make it a contest and vote on the best name(s). The best ones go up on the wall as a header above the sentence. My only rule is that the should help us remember the rule in some way! Students compete to have their group's sentence featured on our Wall of Fame. Each week the table with the best sentence gets to be featured on the Wall of Fame. The first week, if they performed the rule correctly they went up. Now, it's a competition and I was blown away! They must also use at least 2 other types of author's craft int their sentences as well... not just the "rule" we are learning about. This past week... I chose the best sentence from each class to be posted on the Grammar Wall of Fame! The sentences were amazing since they students knew that only one would be selected and posted! They rocked those hyphens! Sadly, our laminator was down and I didn't think to bring my strips home... so I don't have a picture of this week's work. One winning sentence was about a super-creepy werewolf... perfect for this time of year, right? Don't forget to link up with Joanne from Head over Heels for Teaching and share how you spark motivation in you classroom! Have a great Saturday! We've been working on Mentor Sentences. 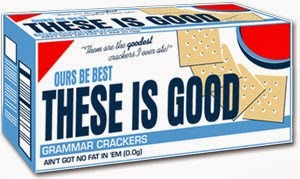 My students are loving grammar! They also really love the great names they get to come up with and the their own sentences that get put on the Grammar Rocks Wall of Fame! This week studied adjective modifying adjective hypens but I haven't laminated our sentence yet.... the laminator was down! But here are some student all-stars from our Serial Comma Wall of Fame. We've been focusing in on character all week in reading! Students are noticing how complex characters can be! We talked about how characters have "layers" and students found "opposites" of a previous character trait and posted them on the Jot Lot this week to prove that characters go through changes in a story. Look at this rock star student citing the page number! Love it when they follow directions! Students also used stronger word choice as we wrote about characters in reading writing thanks to Joanne's at Head over Heels for Teaching's interactive character analysis posters! Students did a great job choosing higher level character traits from Rules and citing evidence. They are now choosing some of these traits for their character essays which they are writing about their book club characters! I ended up with two of these as gifts this week... I noticed now there are necklaces as well as bracelets. So far these are more crafty and fun than out of hand like the silly bands. Plus, only the girls are wearing them at our school right now. And they don't seem to be as big of a distraction since you don't need to take them off to see what "shape" they make. Evidently, I still need a star-burst design to complete the "the look." A clean desk saves my sanity... it was worth staying after a little longer on a Friday to get everything in order and cleaned up. It's like a breath of fresh air! Does anyone else tidy up before the weekend? © My Shoestring Life | All rights reserved.